This is really interesting, I've been following you're updates closely since you've uploaded that teapot with a similar render. I'm excited to see more! Congrats Keith, it totally works! Great job on bending the CG rules all your test are looking really original and better yet, you must be blasting through animation. Great stuff. Please keep us posted! The squiggle test looks very good, especially when compared to the non squiggle. Very interesting seeing someone explore limited animation in 3d. Limited anim gets a bad rep but I think it's a valuable tool. Color me interested. I suppose I'd have to look back through your blog archives, but is this a variation on the toon shader network in Maya, or something completely different? Whatever it is, it does work; great job Keith. I'm working on a project at the moment which has a very tight deadline so I've developed something very similar to your squiggles. I'm aiming for my characters (the cones were just for the tests) and animation to both sit well with this style so it's really useful to have some tips on what sort of animation works with it. I'll have to try the 'dead holds' method you're using. As well as looking great it seems like, once you get you're head around it, it's a massive time saver! this was drawn with highlighter marker pens. So how did you acheive the effect? Well Keith you are one of the greats. You seem to always send my mind into new territory with your work. Thanks for putting your great ideas up for us all to enjoy. @Brad: I like your tests! The style for your show looks like it will totally work. As for how I did it: I'm using a noise deformer to distress the mesh a bit at the right amount/frequency. 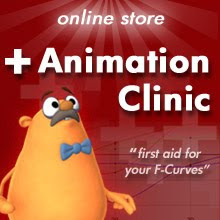 The toon line is Maya's toonline feature with some texture mapped into the line width map attribute. The texture is then animated a bit to break up the line weight. The noise deformer has a slightly different frequency on the color pass and the toon line pass. The color pass is rendered in Mental Ray to get the shading I want, and the toon line pass is rendered using Maya's renderer (MR doesn't handle the toon paintFX stuff well). Comp the layers together with some layer blending modes in After Effects. There's nothing earth shattering going on technologically. It just took a lot of noodling to find the right mix. I'm curious though about having the squiggling on the chair too. I've directed a couple of 2D films where we employed the squiggling line (or "boiling line" as we called it) and sort of came up with "rules" that inanimate objects don't boil unless they're being moved by animate objects. Would you use the squiggling line on every CG-rendered element in a shot? VERY cool stuff Keith. I've got another short I'd love to do that's a lot more "cartoony" and I'm going to do some tests mixing and matching different NPR techniques to see what works together. Holy crap Keith......, I think you're on to something! I'm pretty intrigued. Keith - looks like you've found a great balance with this technique! I've also been wondering about how to work on my own projects at home without the pressure of trying to live up to the big-studio visual standards. Although I appreciate the amazing work these studios put out, I think it would be nice to focus on the content and spontaneity of a fun story rather than the time-consuming process of a polished 3D production. Very interesting Keith. How are you wobbling the final render? Doh... I just saw that you answered that. It sounds like a lot of steps. I wonder if it's something that can be automated to some degree so that achieving the look doesn't have to take up too much of your production cycle per shot. That's the key.. then you can afford to focus on performances and story with the look already in the bag. I used to complex Photoshop macro's to achieve certain natural media looks. That's a pretty easy way to go as you just run the macro on your folder of rendered images and sit back. I tried just boiling the characters and leaving the set pieces & props solid, but it looked wrong. That was one of the things I just had to learn by seeing. As the project evolved I decided to go with empty backgrounds/sets- no CG objects, just bgrd paintings. Once i did that the CG kinda stands on its own layer and to boil only some of it but not other parts felt like a technical glitch. I seriously doubt I'd be able to wobble everything if I went the usual CG route and built out the world 100% in CG. It would just look bad. But since it's just characters, props and a few isolated set pieces on bgrd paintings it worked best to boil all the CG elements. This was a very recent discovery (ie: last Saturday. heh). It is/will be automated to a large degree. I am retro-fitting the characters and props to have the deformation & toon systems built in with adjustable attrs for animation adjustment, and I am writing a pre-render MEL script that will handle the render pass stuff. So the majority of the process will be built into each asset by default. The AE comps are very shallow and I have the template already, so it's a simple footage swap and export. Really the way this is set up once I animate a shot I will be able to render it and comp it the same day. Very light overall. Wow man. Nice rendering skills. This is by far the best test you published so far!!! I love it! Thank you for showing the standard CG--I was wrong. It totally looks dead without the boiling line. This stuff looks great! You have a fantastic style coming together. That's really, really cool stuff. I'm so glad you kept pressing forward with it all this time; the end result works very well. The test looks great! Really digging the style you are going for. It really feels like it's touched by an artist's hand. I'm starting to develop a 2d/3d short with a very painterly look...just tired of all that crisp, hard-edge cg. Can't wait to see more of your work! Hey Keith, thanks to share all your ideas and thoughts with us, it's a great idea. This technique looks awesome! I tend to agree with Galen as far as the chair seeming somehow not right. Maybe there is a way to tone down the squiggling on the chair? Either way, very promising technique! Love your blog! You make me wanna animate right this moment. Great style and love the lifelyness even despite its flat moving holds. You got yourself a fantastic toolbox. This is why people generally like to watch rough motion tests / flipbooks, etc. AND I believe it's a huge reason for the appeal in Bill Plympton's cartoons. You have to be feeling pretty good about this. Knowing the thought you put into your work, your attention to detail, and honing in on the look... it makes me look forward to your work that much more. Your result works great! You can be proud of it. It does breathe a lot of life into CG animation. I will certainly consider this idea for a CG shortfilm project I have in mind, where I want to achieve a very stylized 2D/non-CG look. The "squigglies" as you call them will be a nice thing to explore to make it live, and not just be a moving comic-book.